Pronghorn antelope wintering grounds have declined significantly in Wyoming’s two largest natural gas fields, according to a WCS study. Natural gas development in Wyoming’s greater Yellowstone ecosystem has resulted in an 82% decline in quality pronghorn antelope habitat, according to a study conducted by the Wildlife Conservation Society. Over a five-year period, researchers tracked 125 female pronghorn using GPS collars in Wyoming’s Jonah and PAPA gas fields and found that well pads, roads and infrastructure were contributing to driving the antelope to the edge of areas historically considered as crucial winter range. 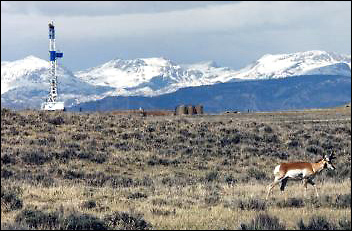 According to WCS, 50 percent of North America’s pronghorn live in Wyoming and are declining in other parts of the U.S.
Western Wyoming herds (including the Grand Teton National Park herd that conducts the longest overland migration in the continental U.S.) winter in the region containing gas fields, However, herds that were attracted to the mesa above the natural gas deposits with windswept flat terrain and lack of deep snow are now being forced into less desirable areas. “In our study we have detected behavioral shifts for pronghorn in response to natural gas field development and infrastructure on federal BLM lands,” said Jon Beckmann of WCS’s North America program and lead author of the study. Using directional drilling to reduce surface disturbance and limit habitat loss and fragmentation. The authors warn that pronghorn can only lose so much winter range before they will begin to decline in population. Mule deer have already declined by more than 50 percent in this region. The study appears in the March 2012 print edition of Biological Conservation.